Movavi Mac Cleaner is an effective tool for OS X systems that will help you clean your MacBook Air or Pro, iMac, Mac mini or any other Apple computer. Unnecessary files left over from different applications, even after uninstalling, can take up disk space and slow your computer down. You probably don’t even know these files exist, but they are still clogging up your hard drive! Anyway, don’t worry. 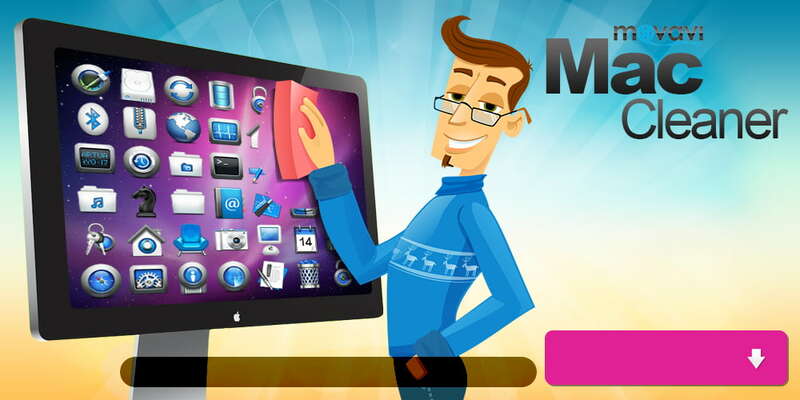 Movavi's junk cleaner for Mac can find and permanently delete these files, so your system will run faster. 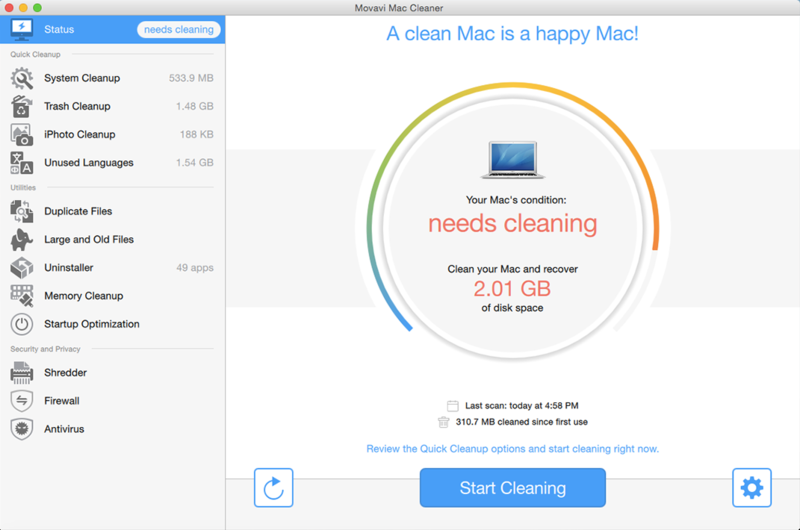 It’s one of the best Mac cleaning utilities on the market. When you launch Mac Cleaner, it will immediately check the status of all the files on your Mac. All the garbage files hiding on your hard disk will be revealed — no need to search for them yourself! Click just one button and our Mac system cleaner will quickly and safely remove unnecessary files that are wasting space on your hard drive. Cache files. Clean the user cache, system cache, and sandbox cache. Unused localizations. Get rid of unneeded language files that you’re never going to use. Log files. 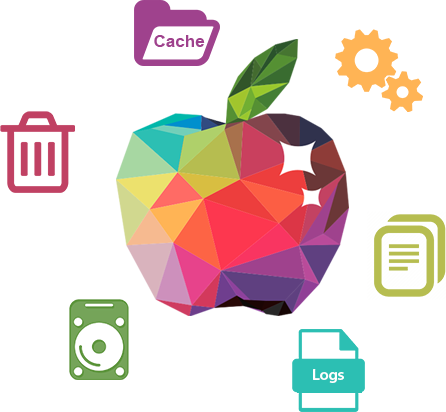 Remove unwanted user logs, system logs, and sandbox logs. Large and/or old files. Delete those weighty, long-forgotten files. Trash bins. Empty the trash bins, including from external storage and iPhoto. Duplicates. Find and remove identical files and free up space. The Disk Usage feature will help you see exactly what is taking up space on your hard drive: Movavi's cleaner for Mac will scan the drive and show you, in graphical form, where all that space is being wasted. It’s a great way to decide where to start your spring cleaning! Just like PCs, Macs are vulnerable to computer viruses and other cyberthreats. The Mac Cleaner app includes robust firewall and antivirus protection to keep your Mac safe and secure. Even on a new Mac, at least 2.5 Gb of disk space is occupied by unnecessary files you’re never going to use. Users spend an average of 1 hour per month waiting for systems and applications to start up. 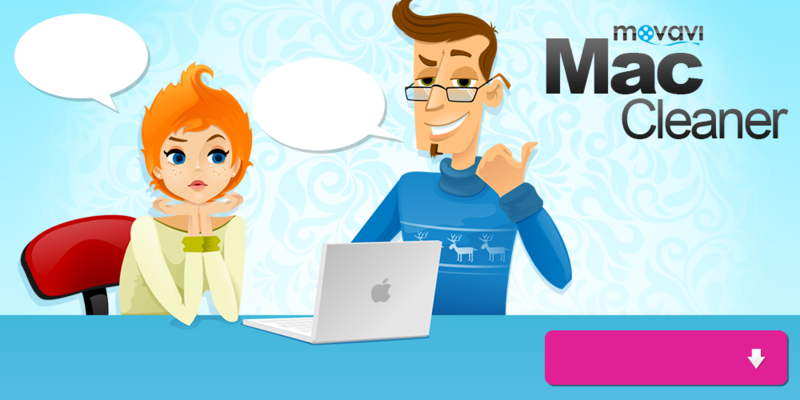 Use Mac Cleaner’s Startup Optimization function to save this time for something more fun! Regular cleaning helps remove about 1 Gb of trash every day. You can use this free space to store 1000 photos, 300 songs or 1 entire movie. 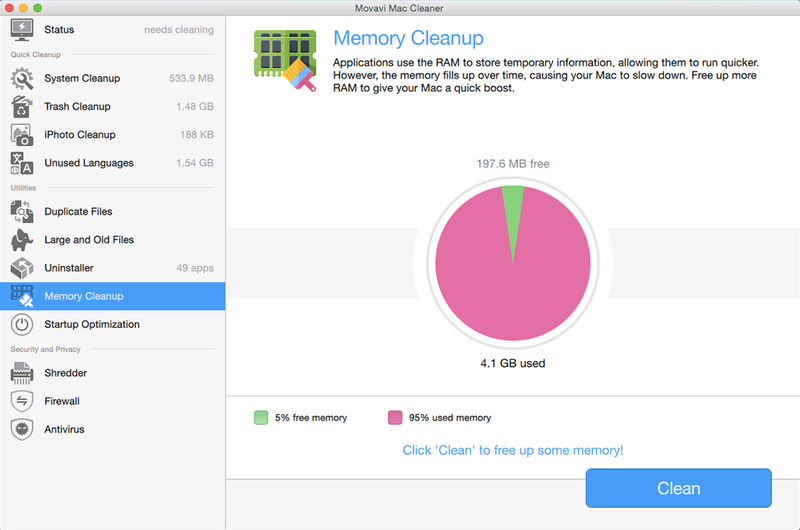 The Memory Cleanup function can give your Mac a noticeable performance boost. 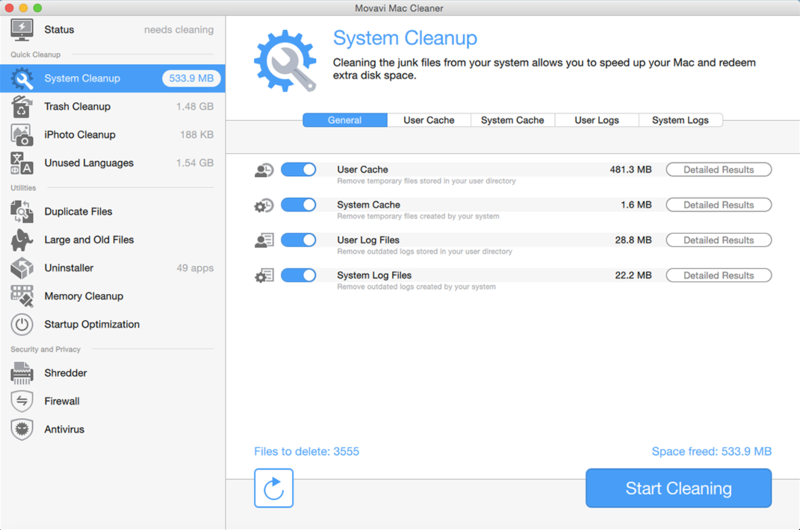 If it’s really «dirty», Movavi's OS X cleaner can make it run up to 2.5 times faster! Say Goodbye to Junk Forever! Mac Cleaner will keep the junk and malware off your desktop computer or laptop. Use this Mac cleaning tool routinely and your computer will always be as fast as new! Although Macs don’t use a registry and are considered more stable than PCs, they still need cleaning. 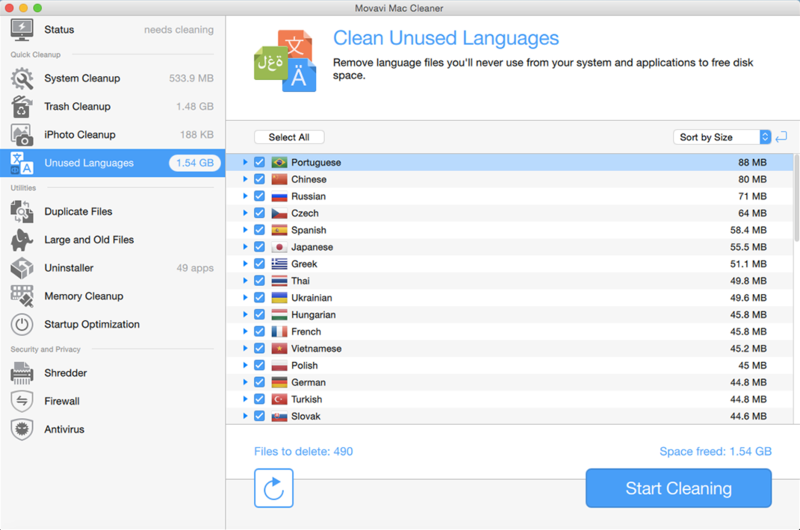 So, if you use any kind of computer from Apple, Mac Cleaner is the right tool to sweep your machine clean of useless data. Just wait until you experience the joy of working on your computer after our junk file cleaner has finished deleting log files, clearing caches, and emptying all the trash bins. 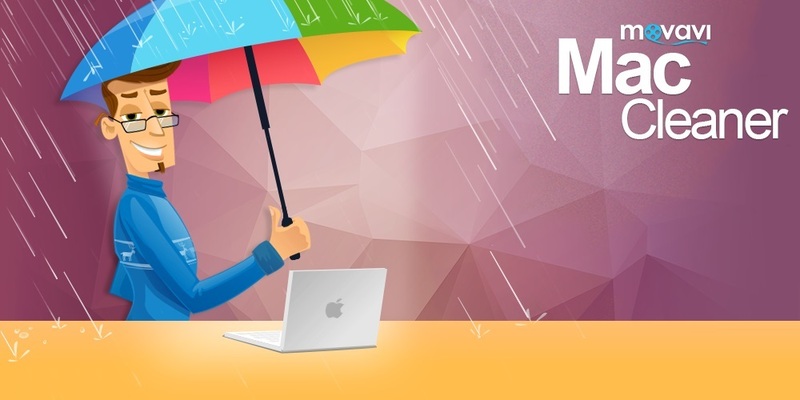 Moreover, if you want to keep your Mac safe and secure, Mac Cleaner is your perfect choice. Clean and protect your Mac today to enjoy it again like a breath of fresh air!